The hunt is on for robbers in Biggleswade after two incidents where victims were threatened at knifepoint. One victim suffered minor injuries during an attempted robbery. The first incident happened at the train station on Monday, 18 June. At midnight, a victim was pulled into an alleyway by two men, and forced at knifepoint to hand over a sum of cash. The offenders then made off after slashing the tyres on the victim’s bicycle. The second incident took place in South Walk on Thursday (21 June), just after midnight. A man was stopped by two men who told him to hand over money and hia mobile phone. One of the offenders pulled out what is believed to be a knife and threatened the victim. He was able to get away without anything being taken, but suffered some minor injuries as a result of the incident. Sergeant Rachael Welch, from the North Rural Community team, said: “These are obviously two very worrying incidents and we are continuing to investigated both cases. “Knife crime is a priority for Bedfordshire Police and we’re keen to find the people who are responsible so they can’t target anyone else. As part of our investigation, we’re asking that anyone with any information comes forward. 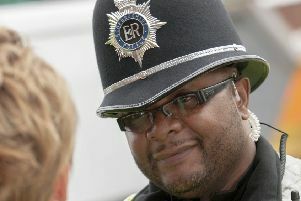 Anyone with any information is asked to report it by visiting www.bedfordshire.police.uk/report, or calling 101. Alternatively you can call independent charity Crimestoppers, anonymously, on 0800 555 111. If you have been affected by crime the Signpost Hub offers free and confidential support to victims in Bedfordshire, whether it has been reported to police or not and irrespective of where and when the crime occurred. Contact 0800 0282887 or visit www.signpostforbedfordshire.com for further information. The reference number for the train station incident is 40/6193/18 and the reference number for the South Walk incident is 40/6528/18.